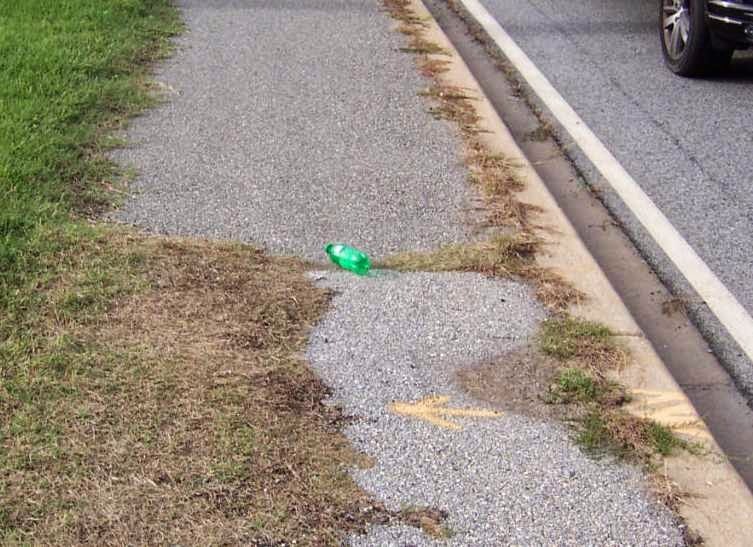 Our current system of multi-use pathways are in ruin, with no budget for even basic maintenance. Penalties for failure to yield in a crosswalk are so negligible, as to be laughable. No record of support for on-road bicycle facilities, most notably during Pave & Rehab operations. 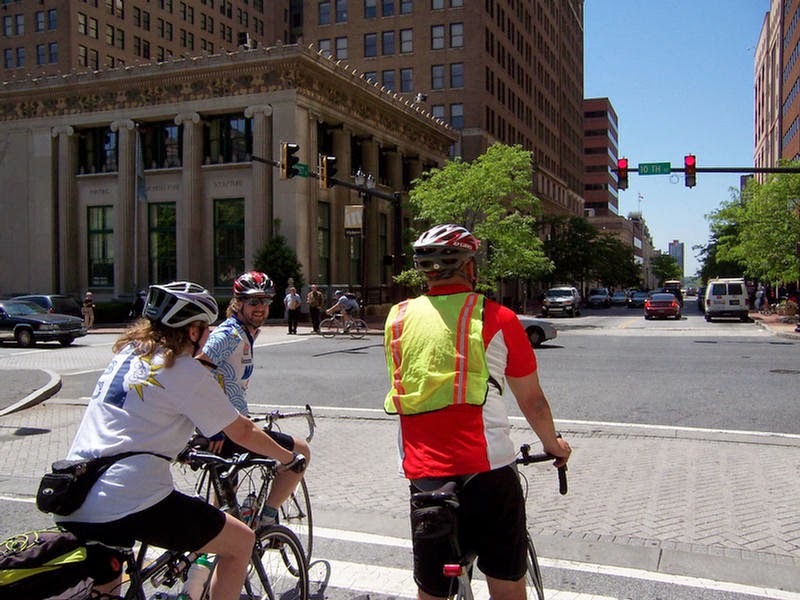 Lack of cooperation with other organizations that advocate for on-road bicycle safety. 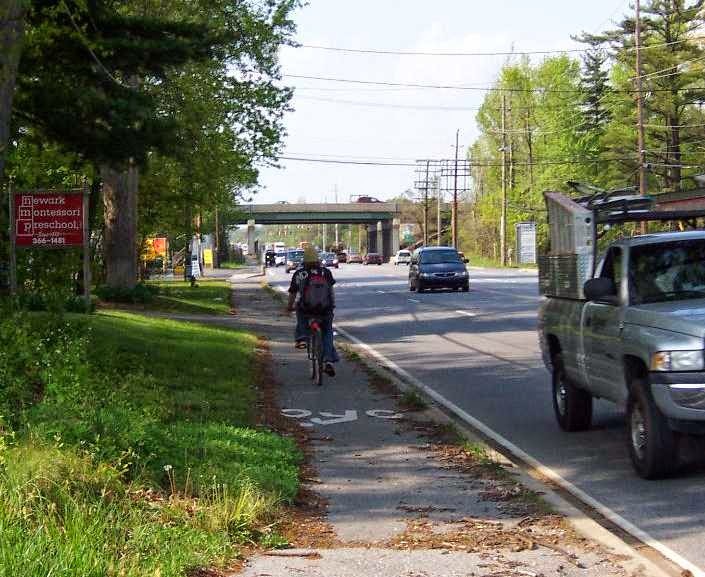 Above: Conditions along the abandoned Route 72 Multi-Use Pathway (MUP) south of Newark are deplorable, to say the least. This arterial highway is centrally located in New Castle County, and with this MUP, offers one of a very few truly safe crossings of I95. There are also many key destinations along this corridor. Yet, bicyclists find themselves hovering dangerously close to high speed traffic, due to deterioration and narrowing of the facility. 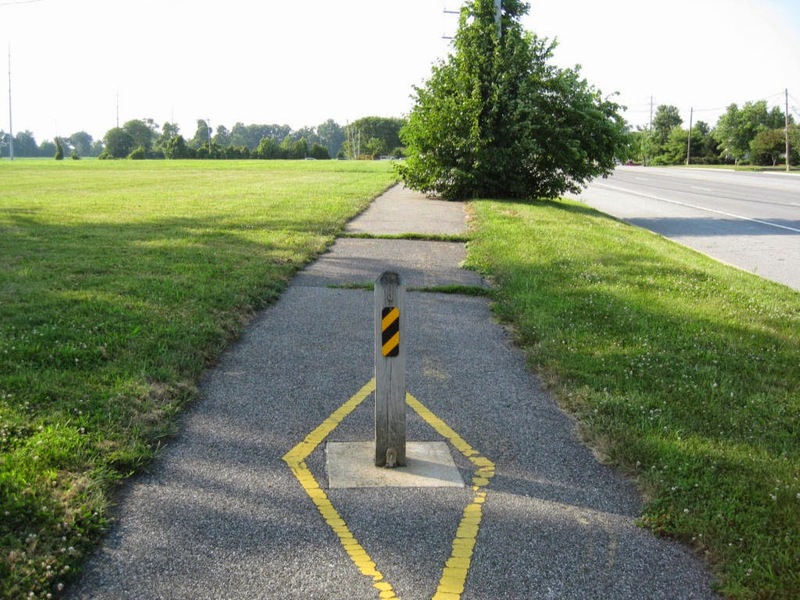 If this is what we have to look forward to with Trails and Pathways, we're in serious trouble. Multiple appeals to DelDOT's "Report a Road Condition" on-line form produced no results in clearing this tree growing up a utility pole (and mostly blocking the pathway). 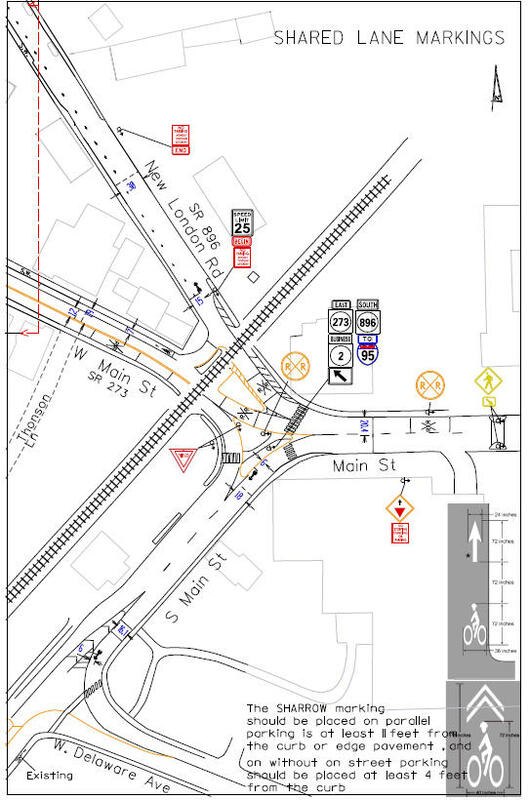 From Angie Schmitt, Streetsblog -- You’re approaching an un-signalized crosswalk. How likely are drivers to obey the law and stop to let you cross the street? According to a national survey of experts, that depends on a few factors, including the width of the road you’re trying to cross, how many other pedestrians are in the area, and even what part of the country you happen to be in. 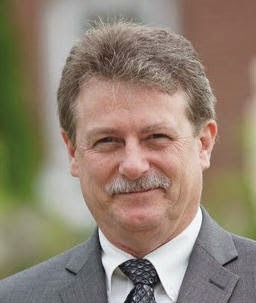 Robert Schneider, professor of urban planning at the University of Wisconsin, and his co-author Rebecca Sanders interviewed almost 400 professionals from the fields of public health, planning and engineering, and safe streets advocacy around North America. 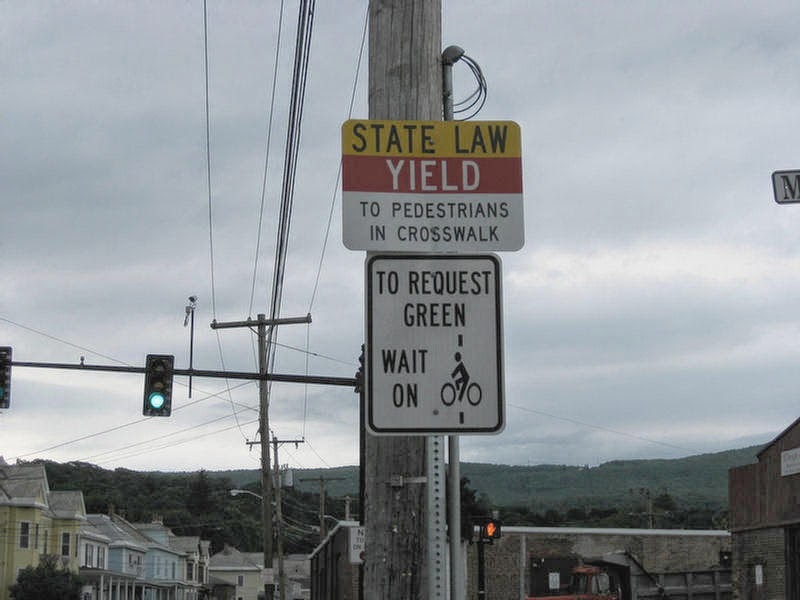 They asked them to assess the likelihood of a motorist yielding to a pedestrian in their town at different kinds of crosswalks that do not have traffic signals. Poster's note: Drivers rarely stop for bicyclists and pedestrians as they attempt to cross Wyoming Ave on the Pomeroy Trail, as demonstrated in the video above. Maybe it's because a check of Delaware law reveals a fine of only $2 to $25, making any type of enforcement simply not worth it. The result is warning signs that are so vague, and so toothless, as to be laughable. The State of Massachusetts is serious about non-motorized crosswalk safety. Maybe it's because they can be, given fines as high as $200. 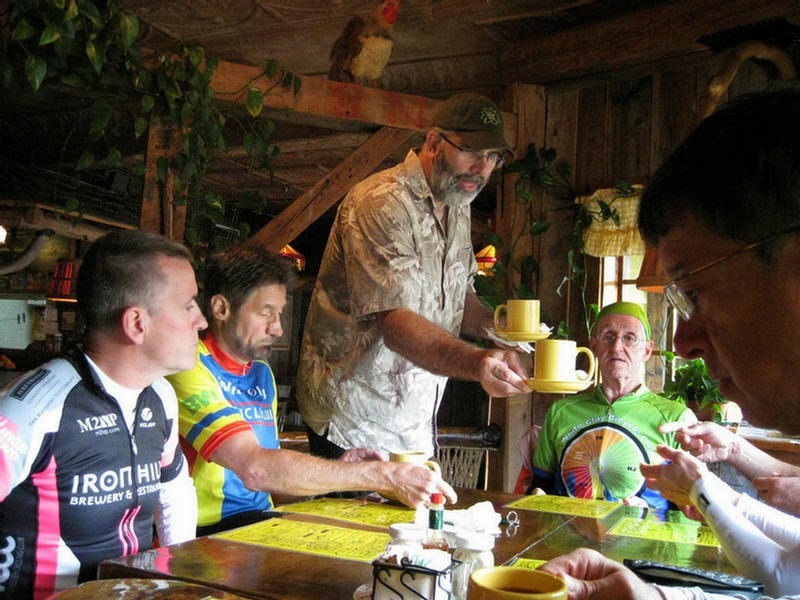 By Carol Ireland -- The local bicycling community was shocked last week to learn of the death of Randy Inglis, a leader in Delaware’s cycling community. Randy was the general manager of The Bike Boutique (TBB) in Wilmington, which is where I first met him. When TBB was in its original location in downtown Wilmington I asked Randy if Bike Delaware could put some Bike Delaware cards in his shop. He readily agreed and we discussed some of the biking issues and recent biking successes in the area. 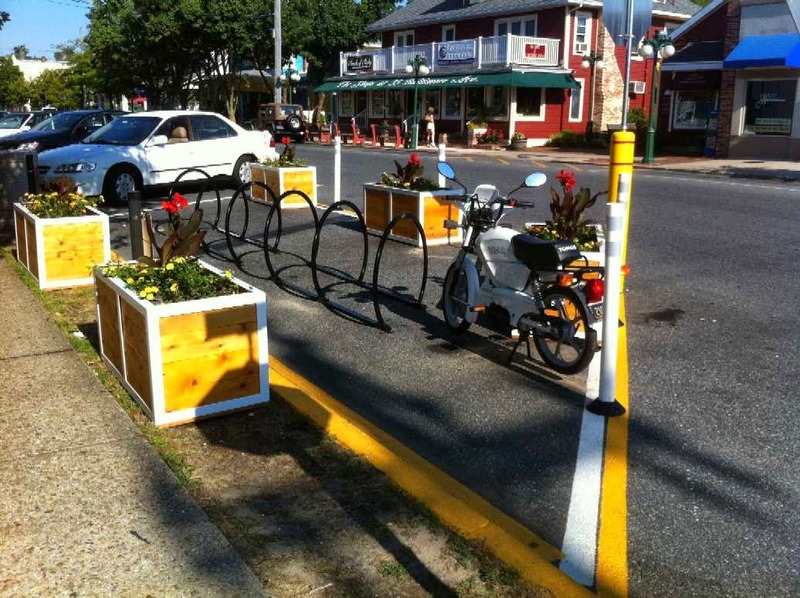 “Summertime in the beach communities of Sussex County is a great time to work on Education, Encouragement, Enforcement, and Evaluation,” four of the five “Es” the League uses to determine the bicycle friendliness of a place, he said. 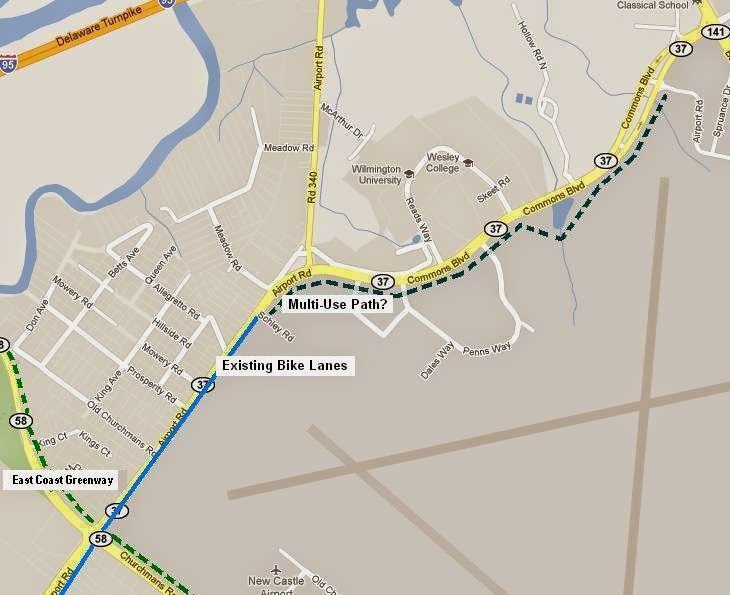 In addition to the dozen or so safety checkpoints and many local rides that happen annually at the beach, this summer DelDOT is working on a bike-mapping effort that will identify routes that cater to less-experienced cyclists. 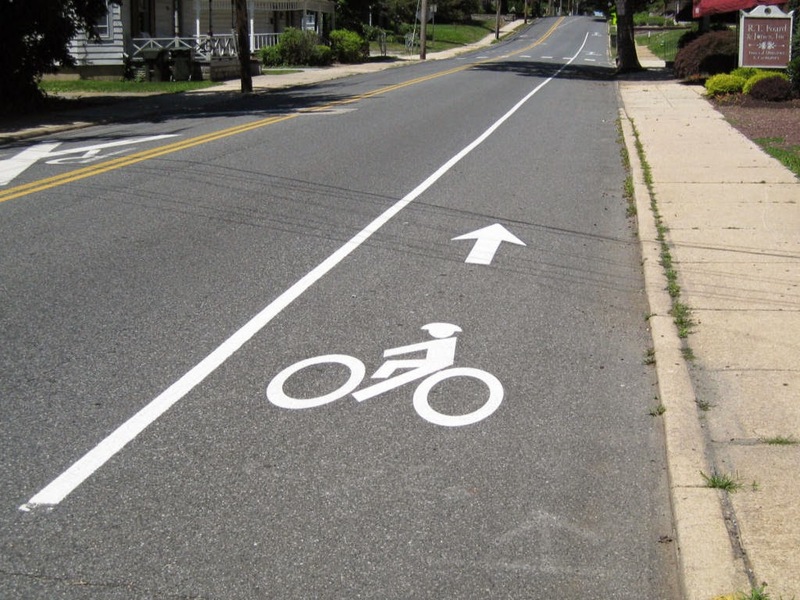 The goal is to get more people bicycling comfortably and safely and make Delaware an even more bicycle friendly state. 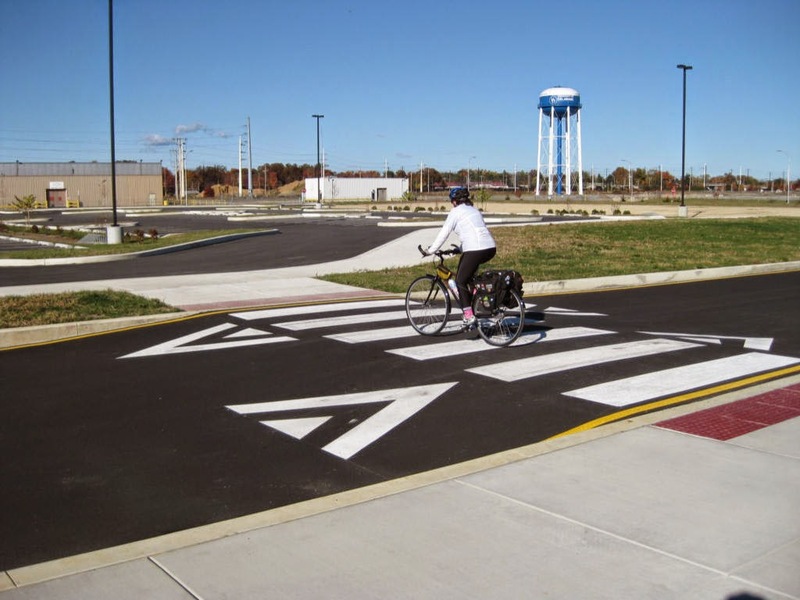 With the help of Wikimapping - a new online public input tool - DelDOT will be able to better understand the challenges and experiences of bicyclists. The Wikimapping web app, which can be accessed at bikeatthebeach.com on a computer or smart phone, is being used for planning efforts around the country. 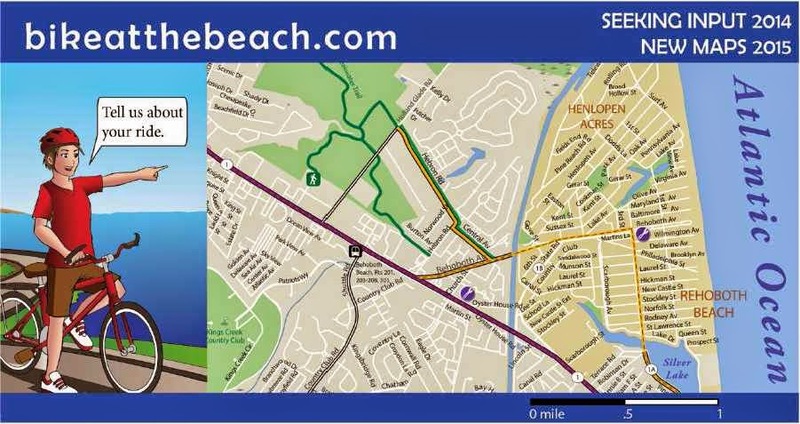 From July through September 2014, Wikimapping is being used to gather input from visitors and locals who bicycle, or would like to bicycle, in the Delaware beach areas to identify popular routes, peoples’ comfort on those routes, barriers, and opportunities to improve the network of trails and bicycle facilities. Ultimately, the information gathered through Wikimapping will be used to map family-friendly bicycle routes. These maps will be available through the chambers of commerce, online, and possibly other outlets in summer 2015. 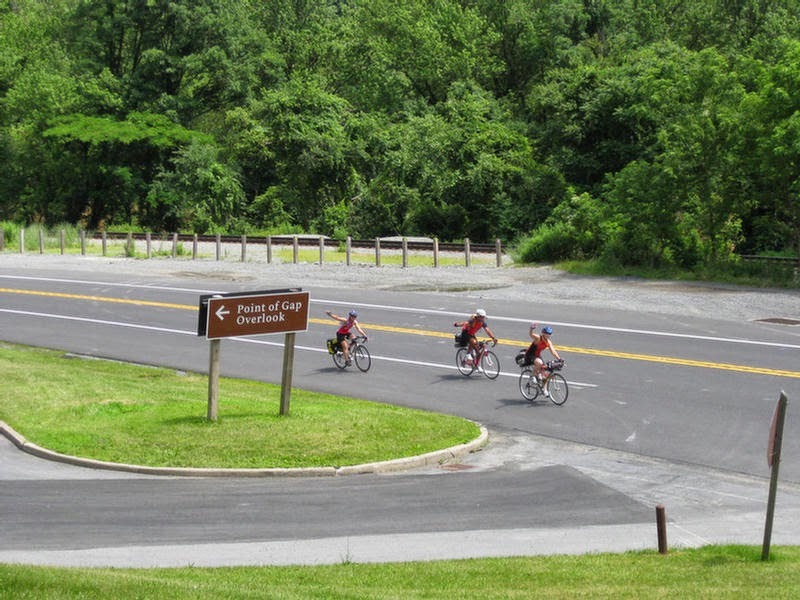 What: Public input using a new online app will help DelDOT produce family friendly bicycle maps and identify challenges for cyclists at the Delaware beaches. When: During July, August, and September 2014, the site will be open for public to submit their experience, concerns, and ideas. 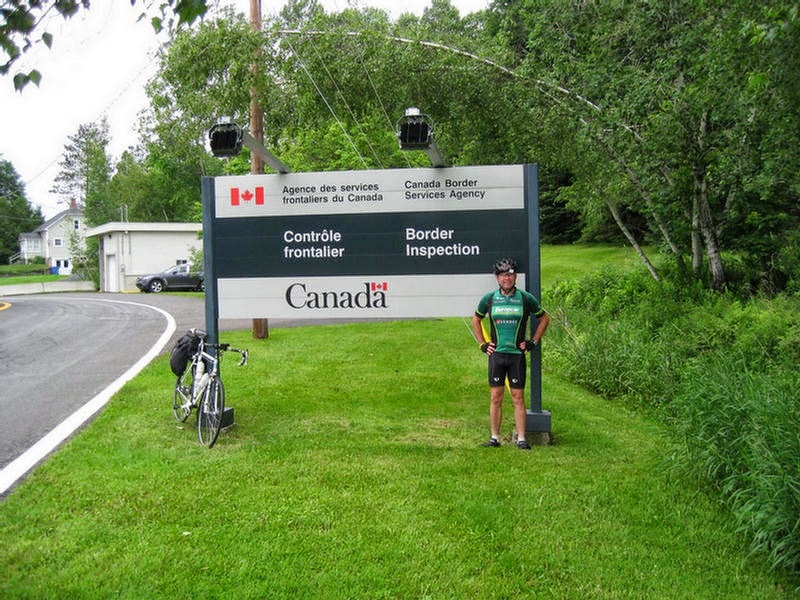 Who: Bicyclists of all skill levels - both visitors and locals. Anyone that rides a bike around the beach communities in Sussex County. 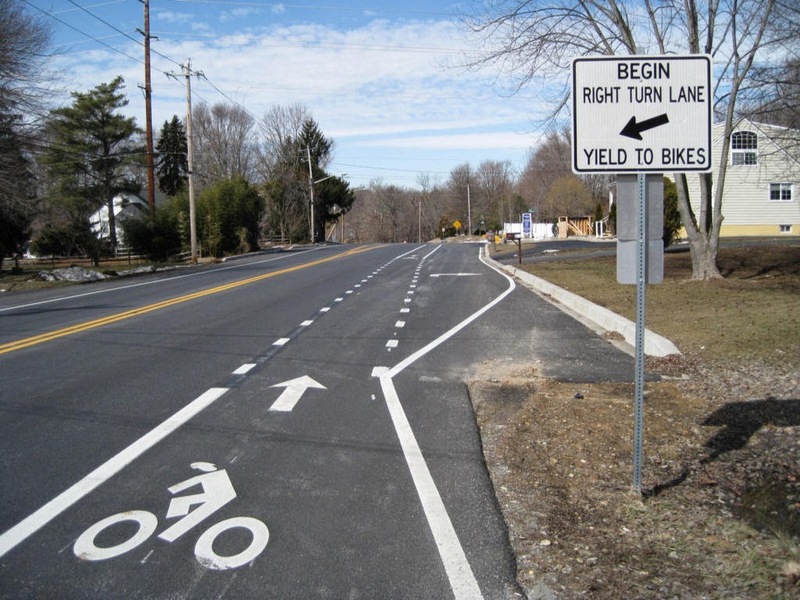 Why: DelDOT is seeking to better understand where bicyclists want to ride, their riding experience, barriers or challenges on their routes. 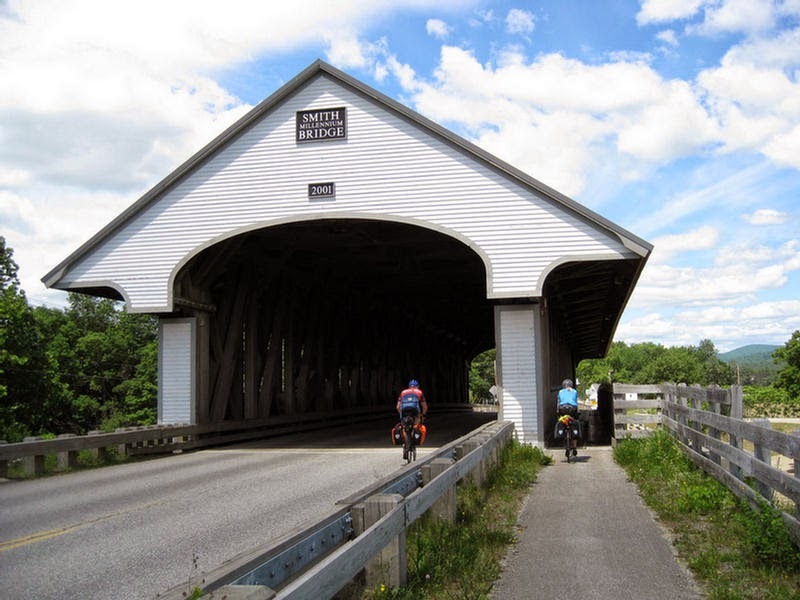 The information will be used to produce maps for the summer of 2015 to help direct less-experienced cyclists and families to safer, more comfortable routes. The information will also be used to identify opportunities for improvements to the bicycle network in years to come. Last week's totally excellent commuting Ed-venture! 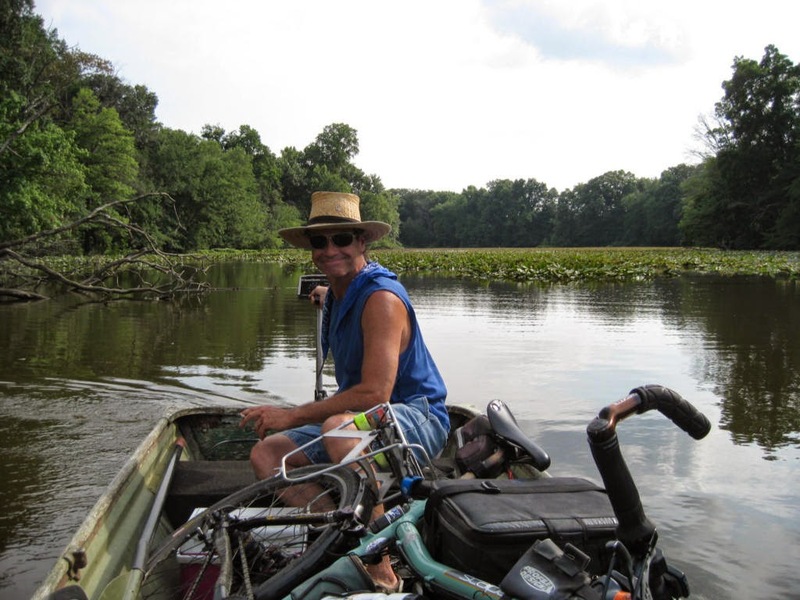 On Thursday, July 10th, I was offered a most unusual commuting option - using Sunset Lake via water taxi (electric powered fishing boat) to reach Purgatory Swamp Road/Route 72. 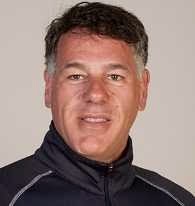 At Skipper was "Indian" Ed Yoder, a wonderful Native American. 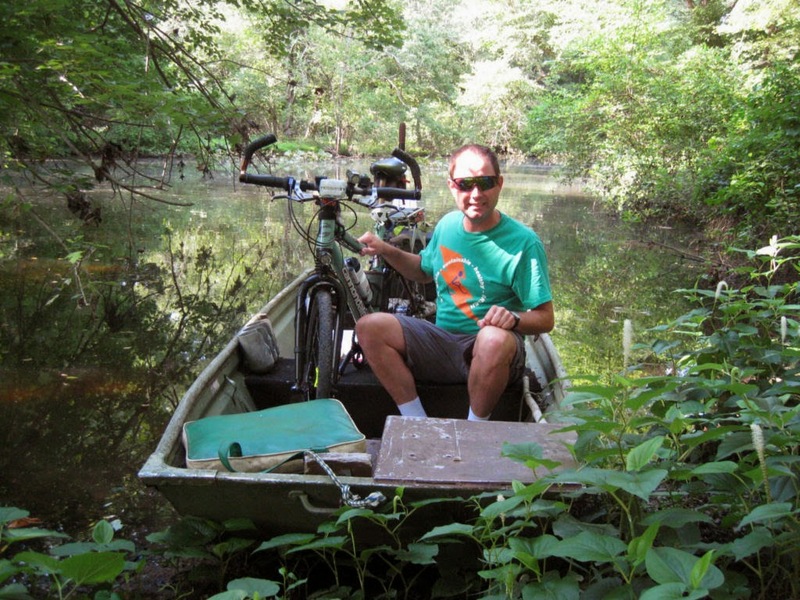 Starting out, it required painstakingly guiding the boat and its propeller around muddy shallows and areas thick with Lily Pads. 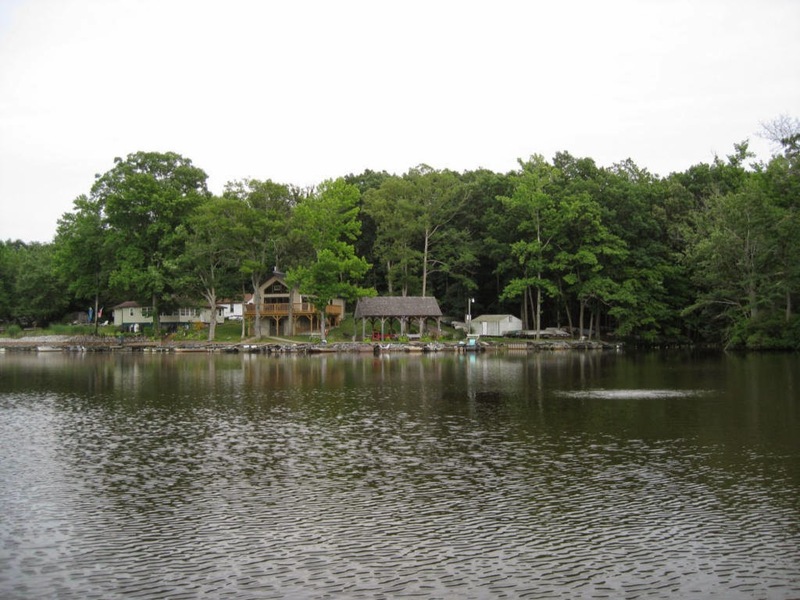 Once in the clear, we headed out into open waters en-route to the Newark Angler's Association's piers and clubhouse. Once there, Ed helped unload my bike. After a lengthy chat and archeological history lesson, I resumed my commute north on Route 72, historically known as Purgatory Swamp Road. My standard commute route follows the solid red line. It leaves Siemens' parking lot and crosses Sunset Lake on a foot bridge, before heading south and east on an abandoned site road. The dashed line is my "Indian Ed-venture", being ferried the entire length of Sunset Lake in a fishing boat. "Indian" Ed steers us clear of the swamp. It was necessary to clear the propeller of weeds a few times, something Ed is well accustomed to! 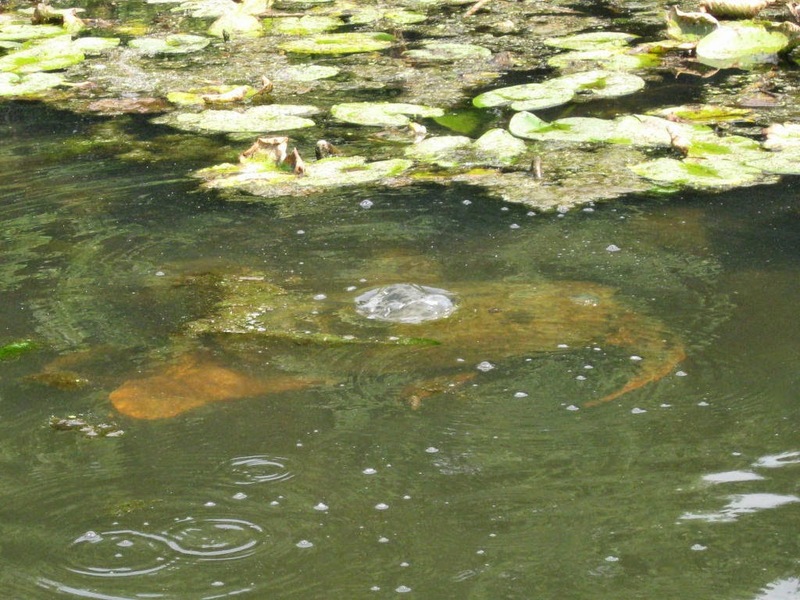 A HUGE Snapping Turtle caught us by surprise. Though difficult to see in this photo, the tail is clearly visible to the right. Home stretch! In sight of the Newark Angler's Association lakefront property. On Thursday, DelDOT contractor Safety Improvements LLC made a second try at fixing improperly installed rumble strips. 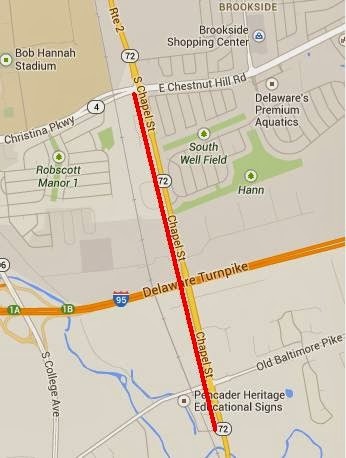 The second test took place on the eastbound side of Route 9, west of Lakeview Boulevard near Lewes (map). 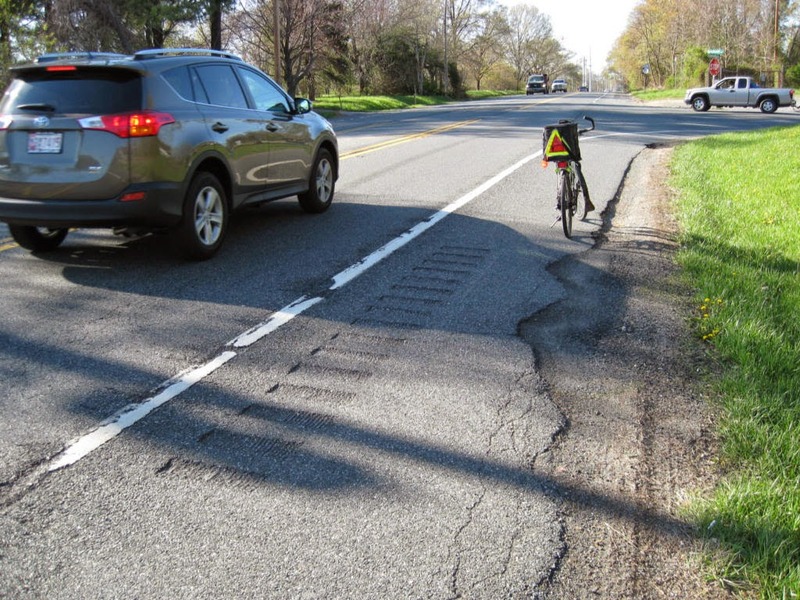 Several weeks earlier, Safety Improvements made a first try at fixing the bad rumble strips on Route 24 near Robinsonville Road (see image at right). 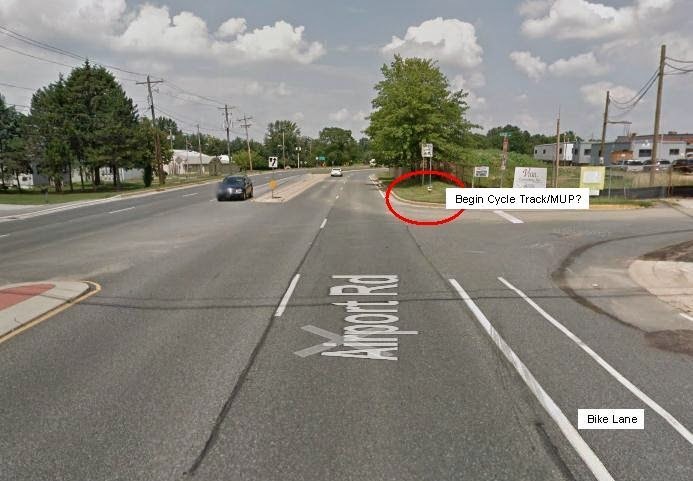 Bike Delaware evaluated the fix and, reluctantly, reported back to DelDOT that it was a failure. 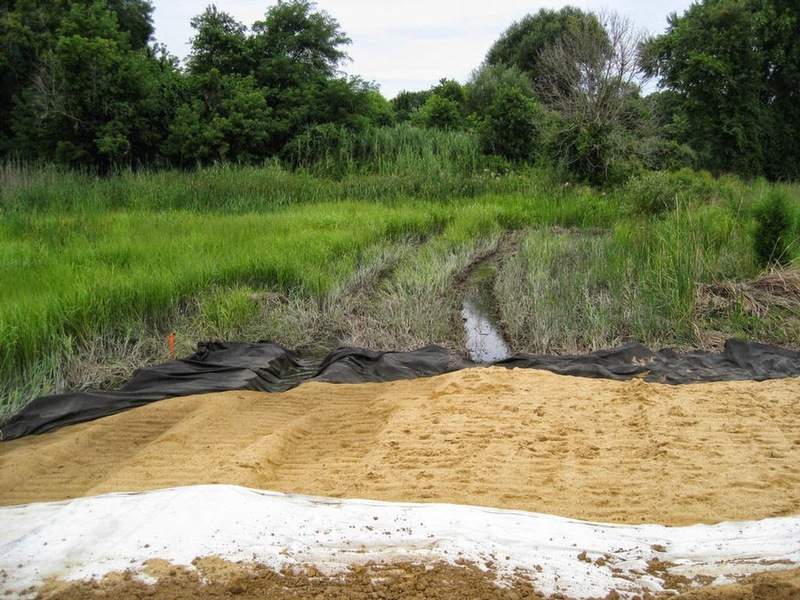 The patch material formed mounds that were not flush with the surrounding pavement and was, as a result, effectively unrideable. So far, all the attention has been focused downstate. The same hazardous rumble strips were also cut on several roads in New Castle County, including Route 72 (above). Poster's note: Delaware Bikes first reported on this issue well over a month before it drew Bike Delaware's attention away from Trails and Pathways. 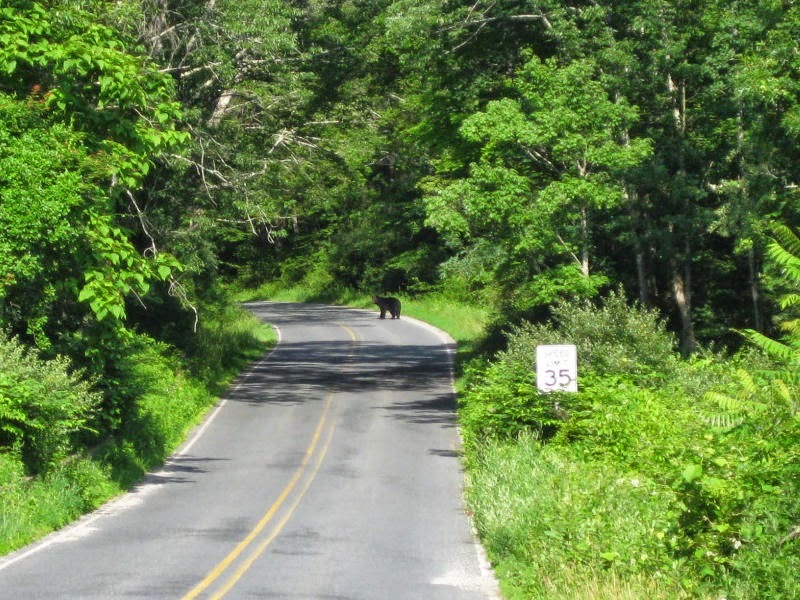 We are encouraged to see this rare and unexpected interest in road advocacy. 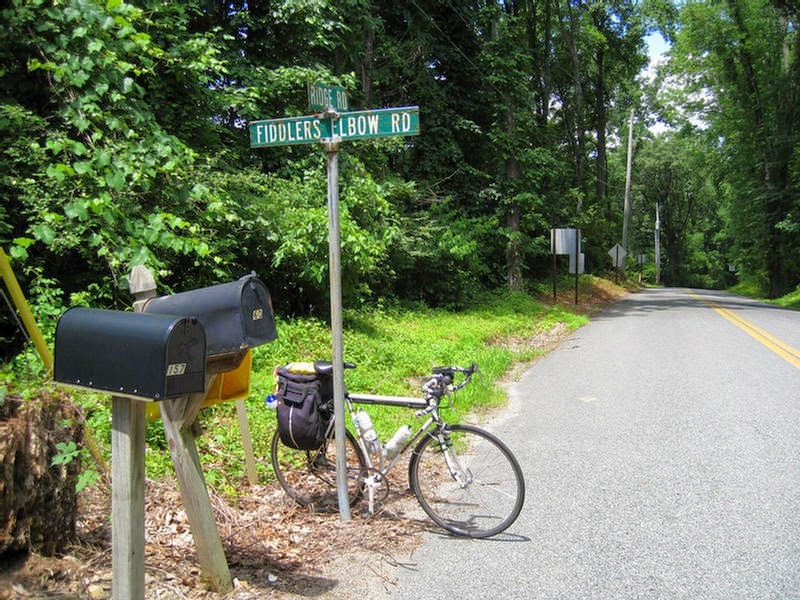 Delaware Bikes is a non-profit Advocacy and Advisory Committee that communicates primarily through a Blog known as DELAWARE BIKES. 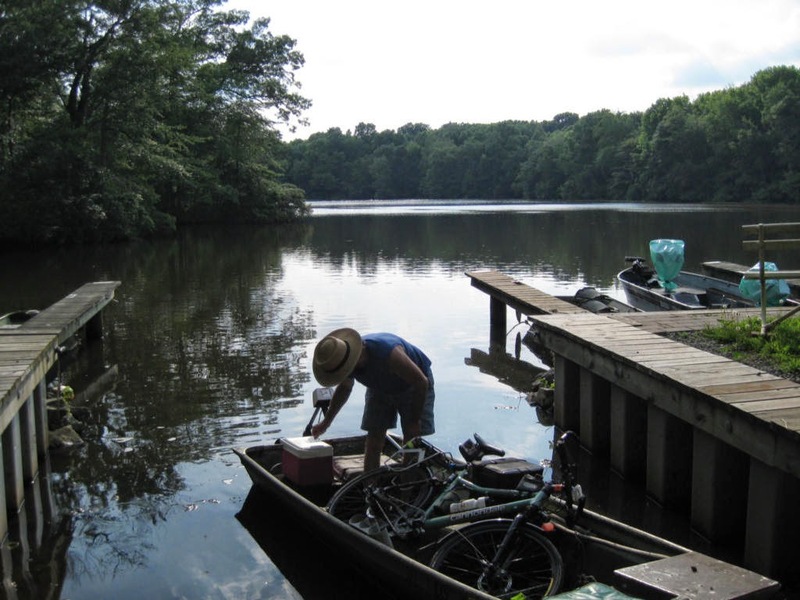 Delaware Bikes does not solicit members, nor does it ask for monetary donations. 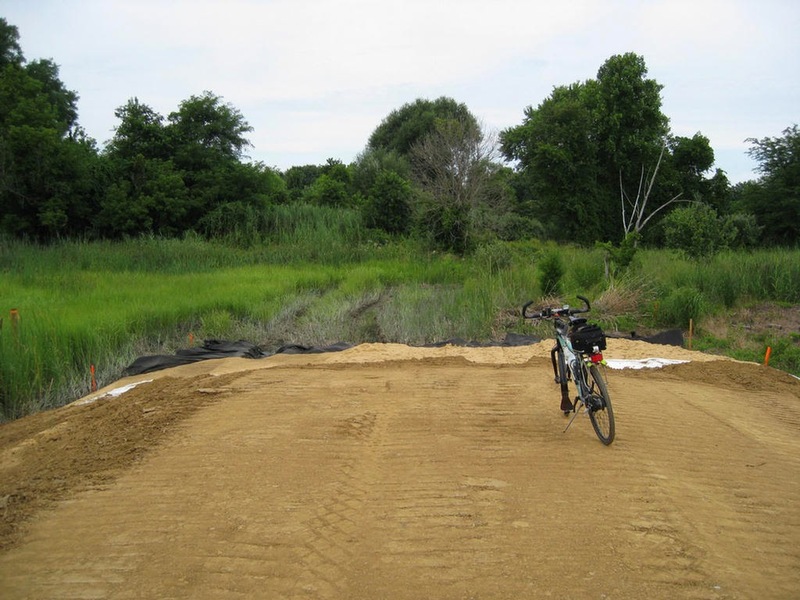 Although based in Newark, the blog covers issues of interest to cyclists statewide. 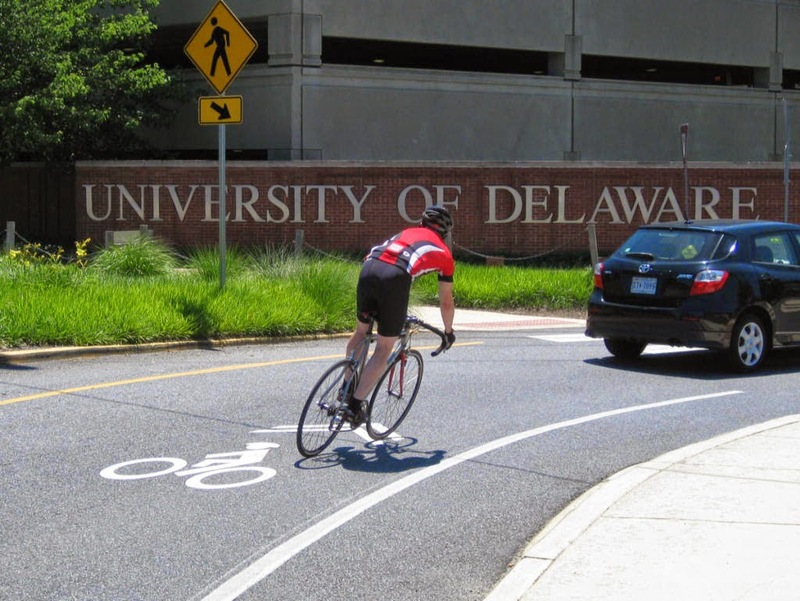 Guided by these 5 components - Engineering, Education, Encouragement, Enforcement and Evaluation - Delaware Bikes is committed to supporting the implementation of, overseeing of, and enforcement of DelDOT's Complete Streets and Bicycle Policy. Delaware Bikes strives to create a safer environment for all cyclists on Delaware's roads and pathways, with a special emphasis on those who cycle as their primary means of transportation, by advocating for improvements within the existing infrastructure. 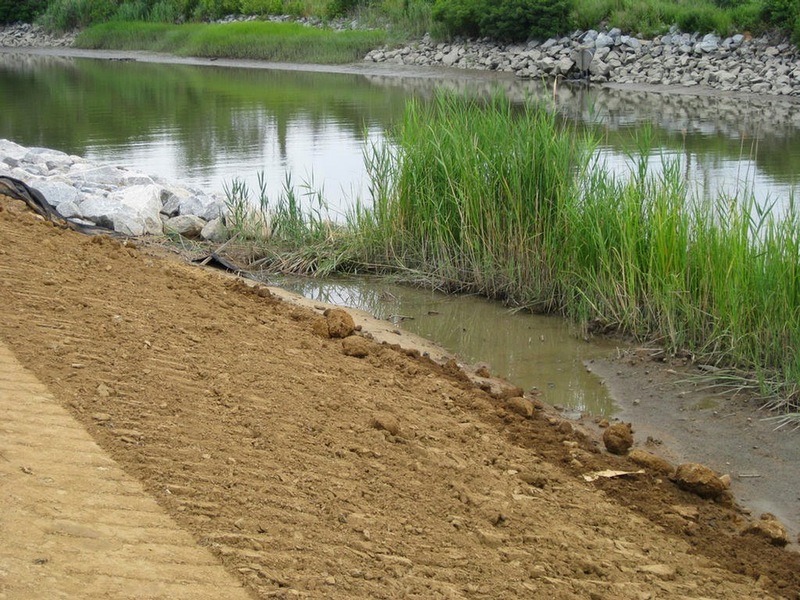 Focuses almost their entire energy on multi-use trails and pathways funding. Has undermined, or attempted to undermine initiatives and projects related to on-road advocacy. Engages in misinformation campaigns through their website and lobbying activities. Does not link constituent organizations, and rarely cross-posts critical issues. Serves few needs and interests of today's recreation and transportation cyclists. "Generally, merely inverting the words in a mark does not distinguish the marks, especially in view of the similar meanings and connotations of the respective marks. The significant similarities between the marks - particularly where the services are identical/overlapping and are directed to the same consumers and through the same trade channels - is likely to confuse consumers." Delaware Bikes does not serve Consumers, nor does it operate within Trade Channels. 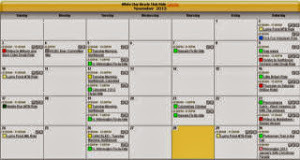 Our focus (or services, if you will) is not identical, and has minimal overlap. 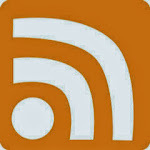 Both websites are available for all to read, and both supply news of interest to cyclists. 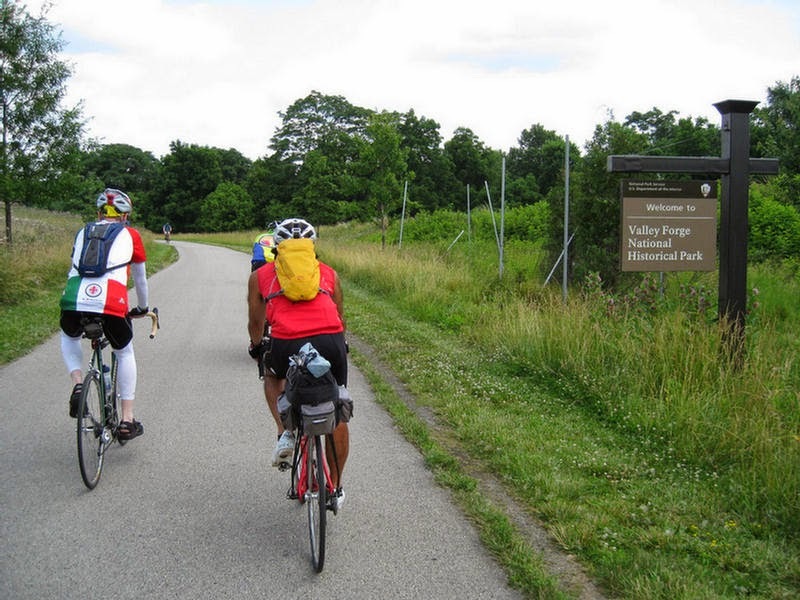 However, a critical difference between us is that unlike Bike Delaware, who requires that members pay a fee, Delaware Bikes does not solicit memberships nor do we accept donations of any kind. Therefore, we question the "competition" that they allege. And indeed, many people read and follow both websites. UDaily, 9:30 a.m., July 10, 2014 -- The University of Delaware announced today it has terminated its lease agreement with The Data Centers, LLC (TDC), putting a halt to TDC’s plans to develop a data center on the University’s Science, Technology & Advanced Research (STAR) Campus. Following analysis of TDC’s plans, the UD Working Group concluded that the proposed facility, which included a 279-megawatt cogeneration power plant, is not consistent with a first class science and technology campus and high quality development to which UD is committed. The findings are detailed in the Group’s report. View the report PDF on UD’s website. Now, let's get on with developing the STAR Campus in a green, sustainable manner. Related: Coverage in the Wilmington News Journal. A brand new bike lane retrofit on Limestone Road in Pike Creek. Note the scrub marks outlining the original right turn only lanes - these will fade in time. 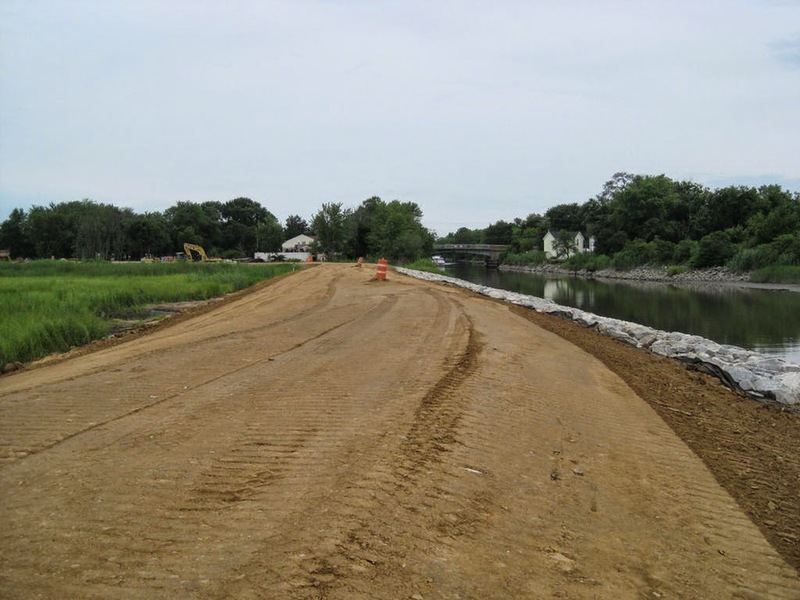 This project demonstrates that improvements can be made anytime a road is adaptable. 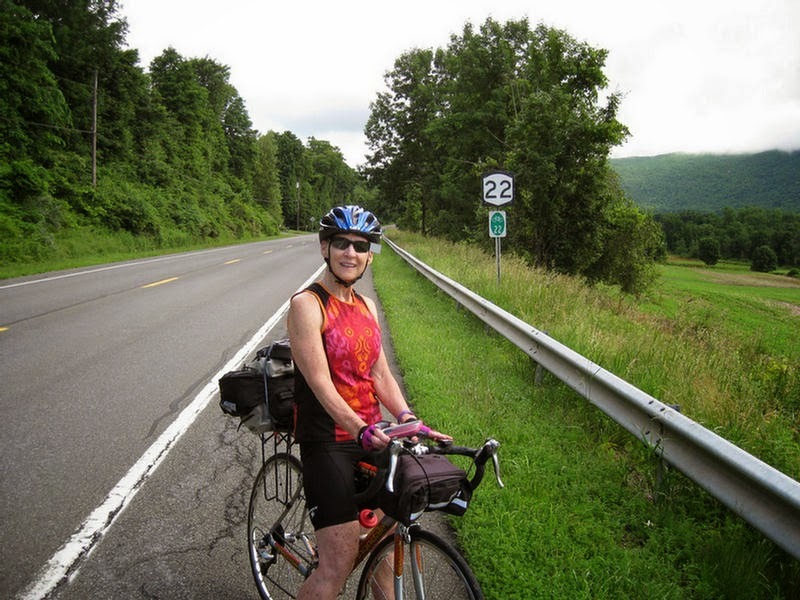 By Amy Wilburn, Chair, Delaware Bicycle Council -- During the winter of 2013, the DBC compiled a “wish list” of bike facilities contributed by area cyclists for each of the three counties. The lists were submitted to DelDOT. 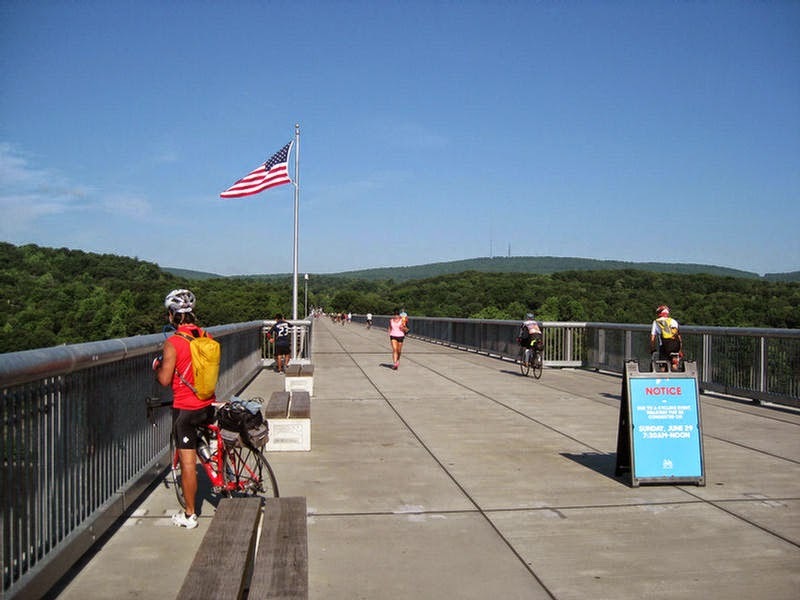 During the summer of 2013, representatives from the cycling community met with members of DelDOT to discuss the lists. 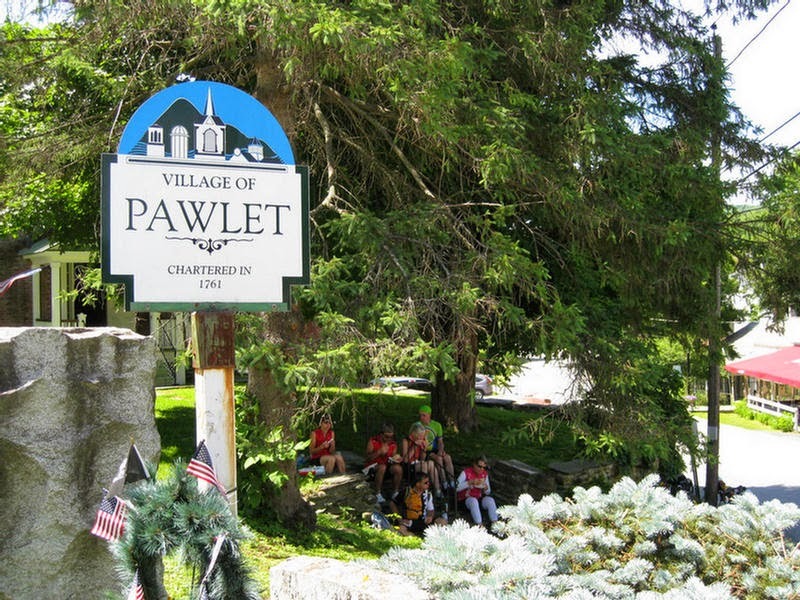 While most items on the wish lists will require either a major construction project or at least a pave and rehab, it was determined that some of the projects in New Castle County and Sussex County are attainable via paint and signage. Fast forwarding one year, bike lanes are being installed on northbound Limestone Road, from Arundel to just north of Stoney Batter Road. Limestone Road, with its direct course, many destinations, and wide shoulder along much of its length is a great candidate for bike facilities. Unfortunately, although the shoulder is wide at all points, it is not always wide enough to accommodate both turn lanes and bike lanes. Therefore, at this time, bike lanes are not being created at every intersection or on most of southbound Limestone Road. The bike lanes, however, are currently in place at a number of the intersections along northbound Limestone Road, and they felt comfortably wide. 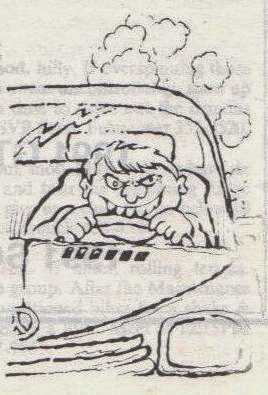 We already noticed a difference in the way the motorists interacted with us at intersections with the bike lanes, as is usually the case. It’s a great improvement. 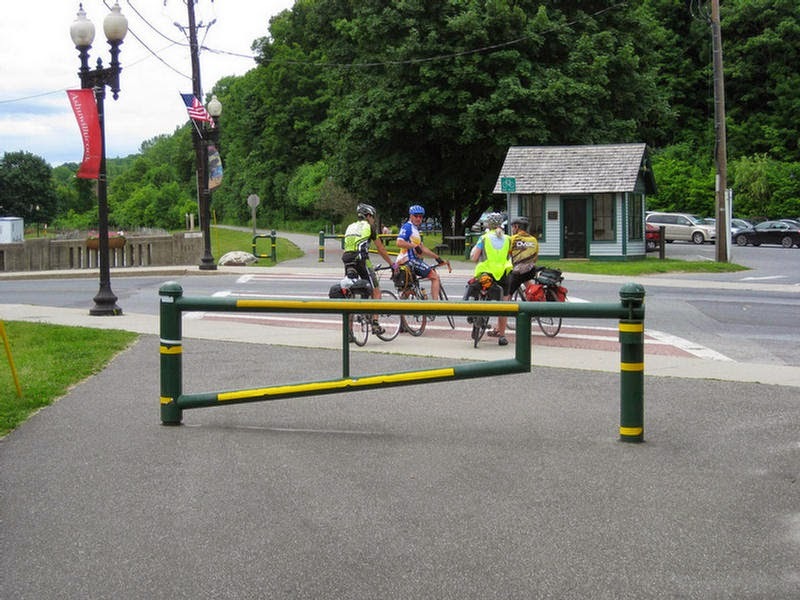 Not only does it provide guidance in terms of positioning for both motorists and cyclists, it provides visibility for cyclists and reminds motorists that we not only are present, but that we have the right to be on this road. What is also notable about these bike lanes is that they were installed totally on behalf of cyclists, without waiting for a pave and rehab project or major construction project based on the needs of the motoring public. 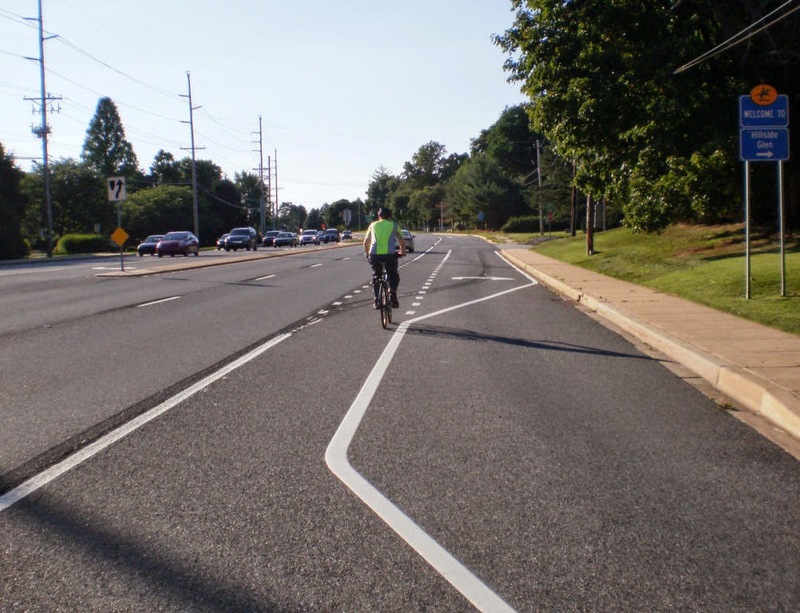 Thanks to everyone in the cycling community who provided input for these “lists” and to everyone at DelDOT who was involved in installing these bike lanes. A special thanks to Mark Lusczc, DelDOT’s Chief Traffic Engineer, for pushing this project through and making sure that it happened. 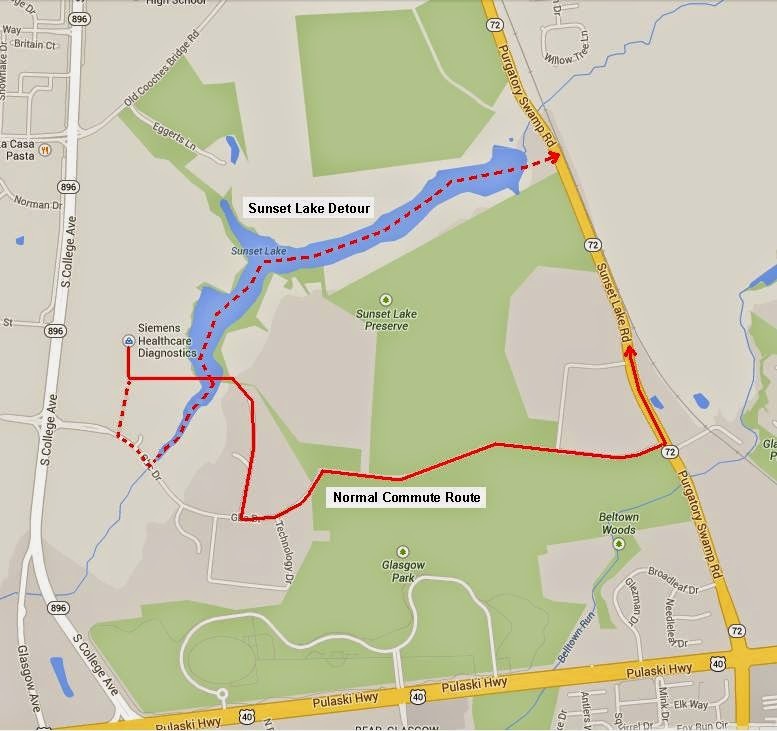 The facilities on Limestone Road don’t yet create a complete route, but they are a great start. We can certainly hope that bike facilities will be installed wherever possible during future pave/rehab and major construction projects on Limestone Road (to complete this valuable route) as well as on other roads that provide important routes for cyclists. So get out there and check out the bike lanes on Limestone Road! Happy cycling! Featured in Streetsblog -- The nation’s intercity passenger rail service just got a lot bike-friendlier. Amtrak announced last week that it is installing new baggage cars - equipped for bike storage - in all trains on its long-distance routes by year’s end. The change will allow Amtrak riders to “roll on” their bikes, rather than disassembling them and transporting them in boxes. The new baggage car equipment is being tested in Chicago, New Orleans, Miami, and the Northeast Corridor, Amtrak officials said in a blog post. Poster's note: Wally Hertler's Annual June Tour (with WCBC) regularly uses Amtrak when going one-way. But with bicycles not allowed on trains, other arrangements have to be made. Usually, this involves loading them on a one-way rented box truck driven by willing volunteers. Maybe things are about to become a whole lot easier? 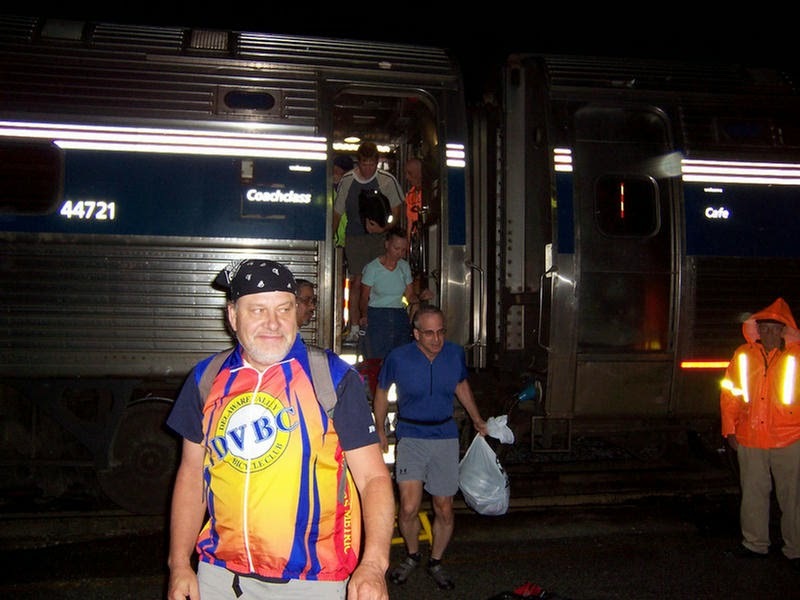 Participants in Wally's 2007 Tour of Vermont and New Hampshire exit Amtrak's Vermonter at its terminus in St Albans. 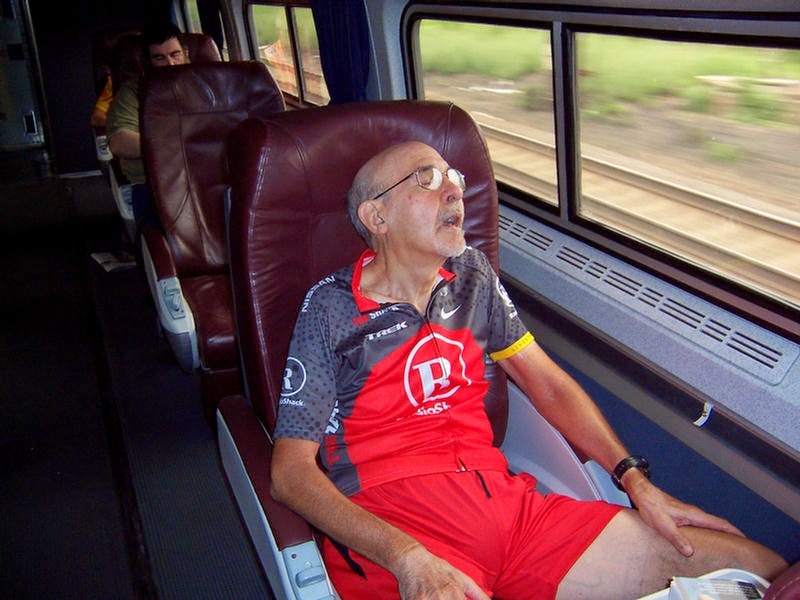 In 2010, Wally captures some much needed sleep aboard the Vermonter, en-route to Saint Albans. 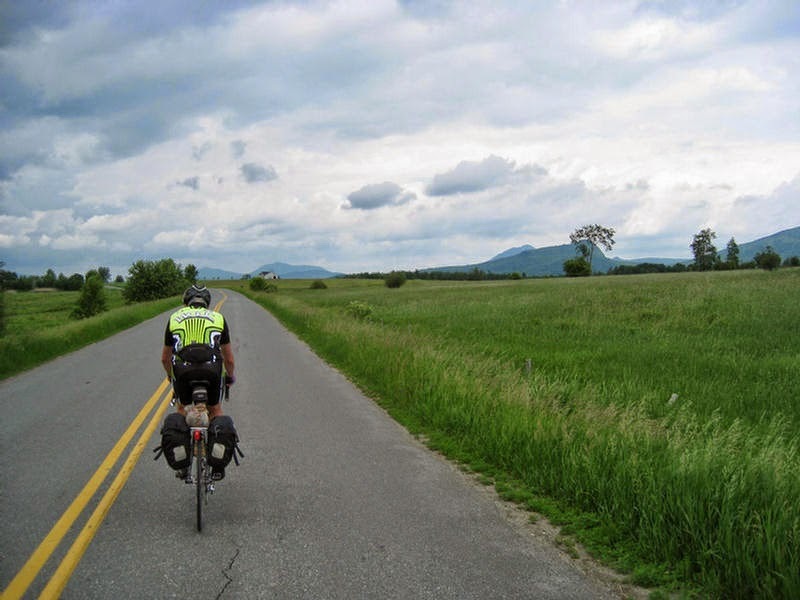 That year, the Tour headed west and south through the Adirondacks and Catskills before entering NJ and PA and ending in Delaware. 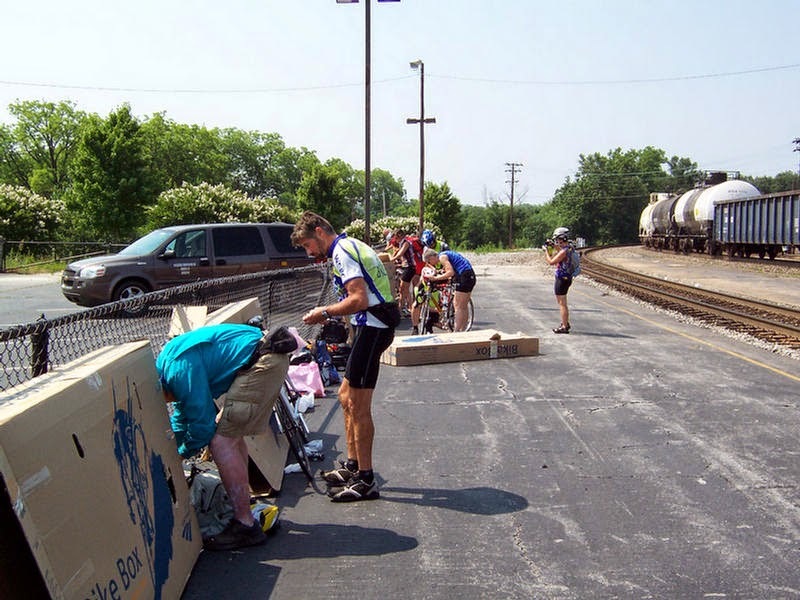 Using checked baggage in 2011, Tour participants unbox and re-assemble their bikes after the long train ride to Greenville, SC. 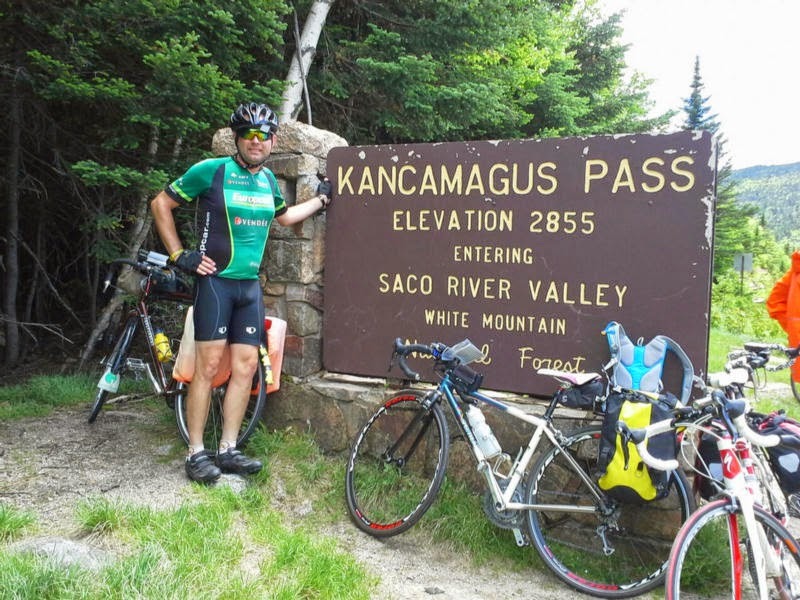 This was an epic Tour that followed the entire Blue Ridge Parkway and Skyline Drive. 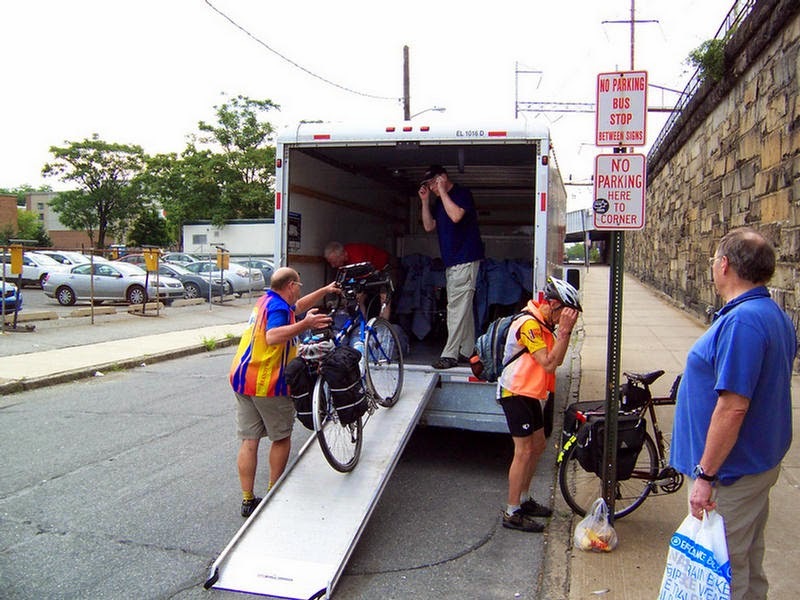 A box truck waits at the Wilmington, DE train station as participants load up their bikes and some belongings (2007 Tour) before boarding the train.